Ankle pain is often due to an ankle sprain. 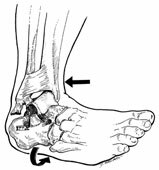 The ankle is the most commonly sprained joint. A sprain is an injury to ligaments, which connect bones to one another and is caused by the twisting or bending of a joint into a position it was not designed to move. Some common symptoms of a sprain are pain around the joint, swelling, and bruising. The most common way the ankle is injured is when the ankle is twisted inward (inversion injury). With this injury, ligaments that support the ankle can be torn which leads to swelling, inflammation, and bruising around the ankle.This makes the ankle somewhat unstable and difficult to stand on. The vast majority of ankle sprains can be treated by taping the ankle or using an ankle brace and ibuprofen or other anti-inflammatory medication followed by a comprehensive sprained ankle rehabilitation program. An ankle sprain injury may take a few weeks to many months to fully heal but with an advanced aggressive rehab protocol, 85% rehab is possible in as little as 7-10 days. Often, the injured ankle remains a little weaker and less stable than the uninjured one. A proper physical therapy program such as the one found at www.fastrehab.com can prevent this problem. The key points of rehabilitation are to control the pain and swelling by taking ibuprofen and RICE (rest, ice, compression, and elevation), then restore normal range of motion, strengthening muscle groups, and retraining proprioception of the ankle joint. More than 25,000 people sprain their ankle each day, making sprained ankles account for approximately 1/4th of all sports-related injuries and the most common musculoskeletal injury seen by physicians caring for active youngsters and adults. Bonus tip: Without proper rehab, you are almost guaranteed to suffer another sprain that is more serious within 12 months. This is from hospital ER data. The only way to avoid this is to use a proven ankle rehab program that helps to re-calibrate the proprioceptors (position sensors) in your foot. DISCLAIMER: The results described in our testimonials are what the average person can expect. Your results may be different based on how serious your injury is and how your body heals. "Your rehab for my ankle was very good especially the ice and walking on the running machine. It reduced the swelling quickly and efficiently and even my doctor was impressed. " "I found the program to be a worthwhile investment. The cost was very minimal, and the stretching and strengthening exercises and routine were very easy to do and easy to incorporate into a busy day. I would highly recommend this program to others with ankle issues as an alternative to physical therapy or other more costly methods of rehab. Programs like this one are highly beneficial and save both time and money for consumers, both of which are precious to us all." "Just wanted to tell you thank you. Your rehab program worked great. Your regimen worked great on my ankle. My walking and rehab began a lot quicker than I had expected." "...I sprained my ankle on Monday and was completely bummed because I was supposed to be flying to Vail for a snowboarding trip later that week and was scheduled to play basketball that Saturday. I thought I had no chance, but gave you program a shot. I wasn't better in one day, but I saw noticeable improvement every day and much to my surprise I was able to snowboard on Friday AND play basketball on Saturday, just 5 days after my sprain. I was completely amazed. Thanks for the program.."
Jeff Armstead Lic. Ac. , Sharon Academy Soccer Coach, Sharon Vt.
“Hey Bret, Thanks a lot my ankle is feeling really good. After breaking my tib/fib in June of 2006 my ankle was sore and weak. After doing your rehab program for less than 2 weeks, my lower leg is considerably stronger and my ankle pain is almost gone. My husband, daughter, and I were amazed at how well and quickly your system worked after we first took our daughter to a physical therapist and had her sprained ankle evaluated to be sure that she didn’t have any major tears in her ligaments or other tissue before we began the treatment. Her ankle was swelled up like a balloon, purple and black in places after she injured it on the recess court at school. With the 8th grade school basketball tournament finals just about to begin within the week, our pointguard daughter looked like a very likely scratch on the roster. Thankfully, my husband went online to see what type of fast, effective treatments for ankle sprains was available, and he found your website. We all agreed that it was her best chance to have the opportunity to play in the tourney, so we ordered your information and an ankle rotation board as you recommended to strengthen and retrain the injured muscles to respond properly again. Our daughter was able to complete 3 of the water baths and treadmill directives, and her ankle swelling shrank down to almost normal size – we were amazed and very gratetful for such an effective treatment. Our daughter was able to compete, much to the relief and delight of her teammates, coaches, and, of course, us. This incident occurred over a year ago, and we’ve held onto the instructions we’ve purchased from you, knowing firsthand that this treatment system is highly effective. Thanks for doing the research and for offering a real recourse to those who suffer with a sprained ankle, especially to the athletes who work hard to be competitive in their respective sports. I was jogging in the woods and a kid (going very fast) ran intro me hitting my left calf and knocking me off the trail where I twisted my ankle to the point I could not walk home. I had the added problem of a horrible bruise from my ankle to my knee. I had heard about fast rehab and looked it up. This happened on a saturday evening before a monday holiday. I was told to go to the emergency room...I started fast rehab instead. By the time I saw my doctor on tuesday he said he would have put me in a cast for 6 weeks, but what I was doing just might work. I saw him three more times through out the process. He was amazed. It was fabulous and worked. I did have to do the wobble board a little longer but I recovered right on track. It has been about six months and I have had no further issues. I run no less than 5 miles a day and do strength training a couple days a week with zero problems. Your fastrehab program is exactly what the title says,”Fast”! I can honestly say that with all of the rehabilitation processes ive done yours really stands out. Thank you a whole lot for helping me with my ankle. Your a miracle Worker…Its worked perfectly!